Let’s be honest. Most of us are going to read this book because of the author’s name. We probably all really like the Dresden Files books and we’re going to be faithful to the author and read this new series. Lightning does strike twice, after all. And those who don’t pick this up because of the author, will likely pick it up because it looks and sounds like a cool Steampunk book – and who doesn’t want to be on the Steampunk bandwagon? But we’re all likely to be disappointed. Humans live in ‘Spires’ – massive, city towers, and different spires are ruled by different aristocratic families. Ships sail the winds around the Spires for trade and protection. Spire Albion and Spire Aurora are in a cold war that is heating up fast. Captain Grimm is the commander of a ship, Predator, loyal to Spire Albion, and has been attacking Spire Aurora cargo ships. When his ship is damaged in combat, he is grounded, where the face of the coming war takes on a whole new look. The Prologue of this book does a really nice job of getting me interested in reading further, but it sets the book up as though it is a YA book, and Gwendolyn Lancaster is the primary protagonist. And when Gwen is the focus, this definitely continues the YA feel. There is even a talking cat (or cats) here, but only Gwen seems to be able to communicate clearly with the felines. But when Grimm is the focus, or the battles, we lose some of the YA feel. This is a novel that is trying too hard to appeal to two different reading audiences. This is a fantasy, so scientific laws don’t necessarily apply. Remember that when your reading about the naval battles … er … except that they aren’t battles at sea, they are happening in the skies … but they’re not quite the dog-fights that our airplanes have taken part in. They’re sea battles in the clouds. Jim Butcher also seems to know that readers of this kind of fantasy like cats. Robert Heinlein, Andre Norton, Larry Niven, and even Butcher’s Dresden Files series tend to like cats, That’s some pretty fine company. And our main cat here, Rowl, makes a fine commentator on the often stupid behavior of humans. I really waned to like this book and to be excited about a new series, but I found this book to be mostly cumbersome. Gwen shows a lot tenacity in the Prologue, but is relegated to the role of cat-caretaker later on. Captain Grimm lacked a charm that was necessary to keep me interested. This book is over 600 pages, which is pretty hefty, even by today’s standards, but if this were 400 pages long, it could still probably use some trimming to keep the story moving efficiently. Looking for a good book? 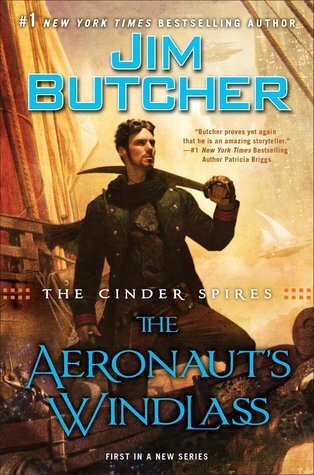 Jim Butcher’s The Aeronaut’s Windlass is a valiant attempt for an exciting new series, but the book suffers from trying to have ‘cool stuff’ in place of compelling motivations and characters with strong goals.